The opportunity arose to nab a copy of the Kickstarter edition of PARANOIA; I couldn’t leave that opportunity hanging. This is the VIOLET pledge level, so I have two copies of most of the contents, I think, plus a stretch goal or two, like the Forms pad. I will be keen to get a hold of this; expect many posts and much thought-outpouring over the coming days, weeks and months. I had intended to hold back on getting this new edition. The RED Clearance starter pack caught my eye, but I hadn’t commited to the pre-order. I have reservations, though these are solely based on preconceived ideas, Communist propaganda, and third-party rumour. I have decided that I would feel much more comfortable making a call on the whole thing first hand – and any reservations I had about the Kickstarter X years ago (3 years?) can now take a backseat. I have held back on crowd-funding before (for various reasons) and regretted the decision (Symbaroum would be a solid example of a bad decision on my part). 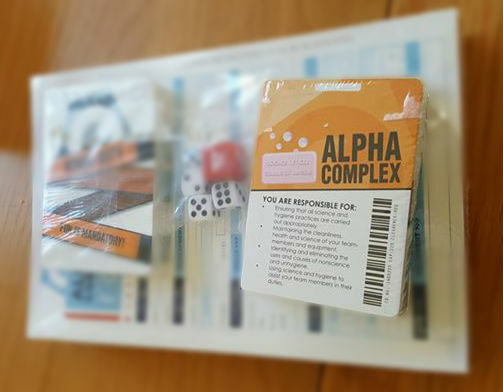 Getting hold of a Kickstarter package through the secondary market will suffice – and now I can judge for myself.